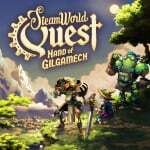 Back in January as part of the Nintendo Indie Highlights presentation, Image & Form revealed its latest project coming to Nintendo Switch: SteamWorld Quest: Hand of Gilgamech. A turn-based RPG with a card battle system at its core, Quest is an entirely new direction for the SteamWorld series we already know and love - made up of eShop gems like Dig, Dig 2, and Heist, for example - and it's instantly plonked itself into our most anticipated 2019 games list. To give us a little more info on what we can expect to see in the game, Image & Form's Julius Guldbog and Brjánn Sigurgeirsson have shared a new episode of the studio's 'Engine Room' series on YouTube. The duo talks about how the game came into being, what the game actually is, answer questions that you no doubt have about the project, and even offer viewers the chance to win a copy of the game for launch, all while showing off little bits of unseen footage. If you're interested, check it out for yourself below. Are you hyped for this one? Let us know if you're thinking of picking the game up with a comment below. I dig the aesthetics, but the card gameplay isn't enticing me to purchase the game. I'll decide on buying it after I read some reviews. I'll always be first in line for any steamworld games, day 1 for me! [In relation to the card mechanics] "It's like Megaman Battle Network" - all I needed to hear, no more doubts about this title. I like all Image and Form games, but this one looks underwhelming. FML... I actually watched about 18 minutes of that before having to stop myself. They say very little about the game and are just gently waffling. If you're bored or in need of company, watch it, otherwise you'll no doubt get the key information in a much more concise format soon enough. Basically, it's a jrpg with card mechanics (that they emphasise are a big feature of the game). No release date yet. This is probably one of my most anticipated games at the moment. I have high hopes that it'll be great. I guess I'll wait for reviews to decide if I get it or not. Steamworld dig 1-2 and heist (especially heist) were excellent games so I'll keep an eye on this one even if the card system puts me off. Not really into card gameplay games. never played a card computer game but as i have tried a lot of new genres on switch i don't see why i won't get this on sale at least! my love of wargroove is making me think i need to give heist a proper try too! These guy's enthusiasm is infectious. And the visuals are very fun to watch. I was a little unsure with the first trailer, even though I am a big steamworld fan, but now, knowing more, I cannot wait for this game. All of their games have been of great quality to me. Dig 2 is there with the best games on Switch. Even though a card rpg game would not have been my first choice, the streak of quality they put out is trustworthy. So i’ll definitely look into it. Love the graphics and animations, will see the gameplay before i buy. In the selfish words of the girl from Willie Wonka i want it, and i want it now. Their games are some of the best, in terms of lore, esthetics and gameplay. Unless they drop the ball with this one, I am very much looking forward to play it! Indies bring the heart and love of fun back into games better than most. Loving the characters, and I'm not diametrically opposed to a card based battle system, even if I wouldn't usually find myself gravitating towards it. But seeing as this is Steamworld, and seeing as it's bigger, bolder, and sillier than ever before, I'm game.